From Greek statues to Buckingham Palace, the traditional look for marble is smooth, glossy and luxuriant. However, the highly polished look isn’t the only finish available. Creating the final texture and sealing the stone are key steps in any marble worktop manufacturing process, and at Surrey Marble and Granite we let our customers call the shots. The choice of finish can transform a block of marble, and we believe that your personal aesthetic should be the guide. The traditional high gloss finish is still popular, and retains the cachet and elegance given to it by all those stately homes and palaces. It’s an excellent choice for restoration work in period buildings. Once considered a difficult, delicate finish, modern sealing techniques have rendered it robust and easy to care for. Rougher finishes give the worktop a different look, and are ideal for a country kitchen style. Many people feel that the beauty of the stone shows in a more natural way with a less polished finish, making it a great choice for kitchens inspired by nature. As part of our commitment to manufacturing high quality bespoke marble worktops, we offer a wide range of edging and corner styles. These are rarely dictated by the stone or polish style chosen, so you can choose an edging that suits your taste and needs. Edgings range from a simple, squared-off style through quarter and half moons to more ornate bevelled styles. A more ornate style typically suits a period home, while simple styles are ideal for a clean, minimalist or Scandinavian design. 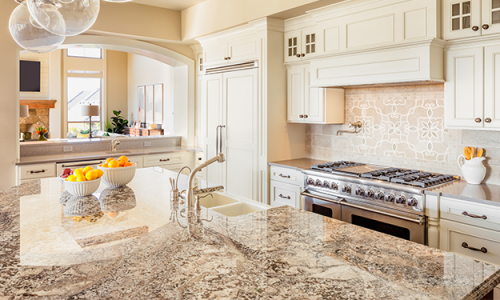 As manufacturers as well as granite worktop suppliers, we take our place in a long stone working tradition. Inheriting and building on the skills that raised cathedrals and palaces, our expert stone workers use a modern workshop at our Surrey office to create modern, bespoke pieces for a wide range of clients. We undertake commissions of all sizes, from kitchen projects to commercial refits. Each project gets the same level of care and attention. Just as every piece of marble is different and beautiful, every job we undertake is different and important. Our workshop and showroom are open to visitors, and we will be pleased to welcome you. You can drop in to view and handle samples of our many stones and finishes. If there’s something specific you want to see, please give us a call so we can make sure we have everything ready for you.